Dianhong tea is a type of Chinese black tea which is produced in Yunnan province. It has abundant soft golden tips on its leaf surface and has a very mellow taste with a hint of dry fruit note. Yunnan black tea, also called Dianhong（滇红）, is a Chinese black tea which is used as a relatively high end gourmet black tea and is sometimes used in various tea blends. The word” “diān”(滇) is the short name for Yunnan province while “hóng” (红) means“red” which derives from the black liquid color. The main difference between Dianhong and other Chinese black teas are the amount of fine leaf buds, or “golden tips,” present in the dried tea. 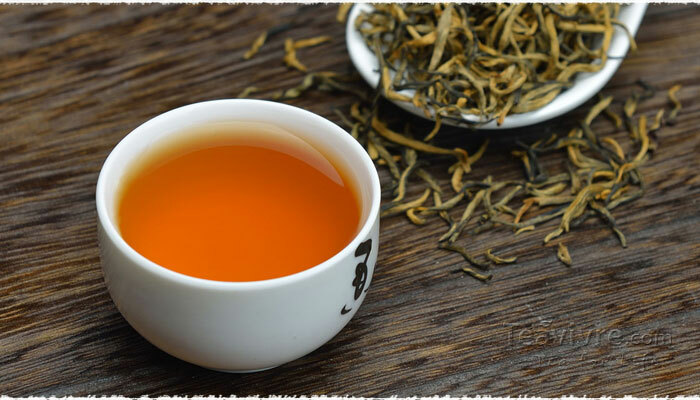 Finer Dianhong produces a brew that is brassy golden orange in color with a sweet, gentle aroma and no astringency. The cheaper varieties of Dianhong produce a darker brownish brew that can be somewhat bitter. 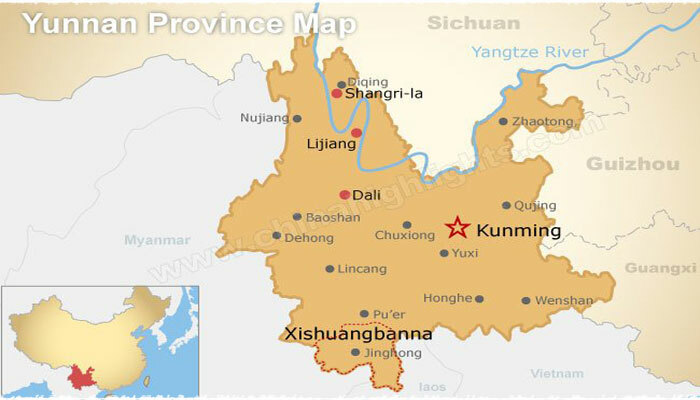 Yunnan is situated in a mountainous area, with high elevations in the northwest and low elevations in the southeast. It spans approximately 394,000 square kilometers and has a population of 45.9 million (2010). It borders Vietnam, Laos and Burma. Yunnan Province features rough terrain which is dotted with cloud-veiled mountains and crisscrossed with meandering rivers. With the influence of both the Pacific and Indian Oceans, Yunnan has a generally mild climate with abundant rainfall and fertile soil, all of which prepare ideal conditions for tea cultivation. According to historic records, Yunnan has a history of more than 2,100 years since it domesticated the aboriginal tea 野茶 (known as the &apos;wild tea&apos;). The earliest records about tea plantation in Yunnan can be traced back to Han dynasty (206 B.C.– 220 A.D.), during which teas were typically produced in a compressed from similar to modern pu-erh tea. 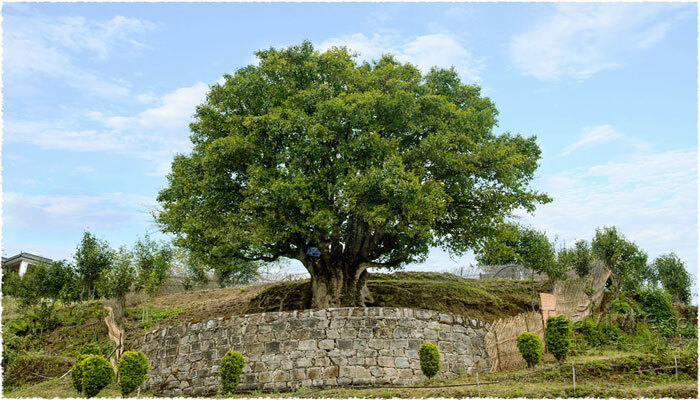 In Yunnan province, the 800-year-old cultivation type ancient tea tree is still growing in the Nannou Mountain of Menghai County (勐海), the 1,700-year-old ancient wild tea tree now growing in Bada of Menghai County and the 1,000-year-old ancient tea tree now growing in Bangwei of Lincang (临沧) Prefecture which indicates the transition between the wild and cultivation types. They are praised as the &apos;Three Ancient Tea-tree King&apos; of the world. Those ancient tea trees are regarded as the &apos;living fossils&apos; of Yunnan&apos;s aboriginal tea plants. There is a total number of 199 species of local tea trees in Yunnan, including 46 asexual-propagation species and 153 sexual-propagation species. Overall, Yunnan local trees belong to a kind of local tree species known as “large-leaf” , which is larger than other species and is an ideal raw material for producing the black tea and Pu-erh tea. 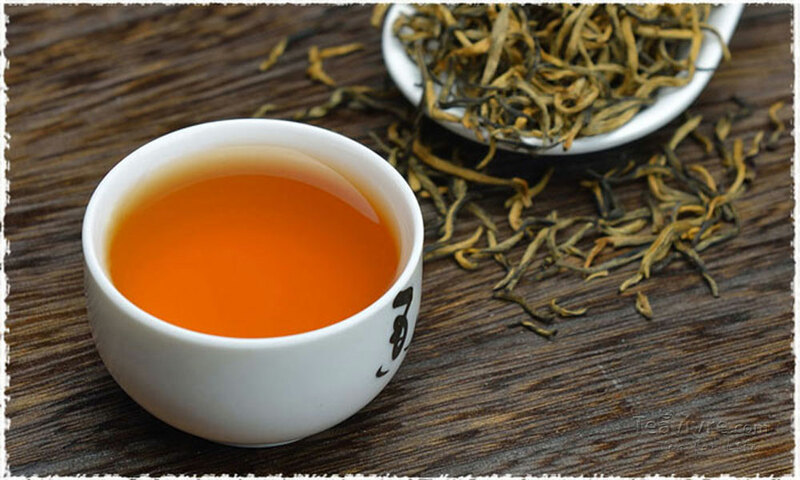 Compared with the small-leaf type, Yunnan tea contains higher catepolyphenol by 5-7% than the average value, catechin by 30-60% higher than the average value, and water-soluble substances by 3-5% higher than the average value. There are 120 tea-producing counties in Yunnan which has 128 counties in all, among them the 23 key tea-producing counties are in mountainous area with an altitude of 1,000 – 2,000 m. Yunnan has a generally mild climate with pleasant and fair weather because of the province&apos;s location on south-facing mountain slopes, receiving the influence of both the Pacific and Indian oceans, and the growing period is long. Much of the province lies within the subtropical highland or humid subtropical zone, with mild to warm winters, and tempered summers, except in almost tropical south. Average annual average temperatures range from 15°-18℃ and the temperature difference between day and night goes up to 10℃. The tea picking in Yunnan focuses on the early march to the end of November, 9 months in all for tea production in whole one year. According to historic records of China, the ethnic Pu people in Yunnan began to grow tea and served it as tribute to the emperors as early as in the Chinese Shang and Zhou Dynasties (1600 – 1046 B.C.). In the West and East Han Dynasties (202 B.C. – 220 A.D.) tea was grown in river valleys and by the mountain trails of Yizhou. In the Three Kingdoms Period, The Nanzhong tea-seed was widely popularized. In the Tang Dynasty (618 – 907), tea produced in Xishuanbanna was marketed to Dali (大理) area and became the favorite drink of the noblemen of the Nanzhao Kingdom. In the Song Dynasty (960 -1279), Pu-erh County became a famous market for trading tea and horses. In the Yunnan Dynasty, tea had become the most important commodity in the transactions undertaken by people of all ethnic groups. In the former part of the Qing Dynasty (1636 – 1912), reputation of the Pu-erh tea reached its climax. The years starting in 1926 and ending in 1936 which were on the eve of the War of Resistance Against Japan marked the most prosperous period of production and sales of Yunnan tea, during which more than 5,000 tons of tea were yearly sold to Sichuan and Tibet, while over 500 tons were exported to foreign countries. Dianhong is a relatively new product from Yunnan. It was invited in November 1938 by Feng Shaoqiu(冯绍裘,1900 – 1987) who is also regarded as the first person using tea-processing machine to produceteas in China. The appearance of Dian black tea caused a sensation in China at that time and it became more and more famous with the time pass by till now. The two most commonly consumed Dian black teas on the market are Dian Congou black tea (滇红工夫) and Dian broken tea (滇红碎茶). The former is made with one bud with one, two or three leaves and the main producing methods include withering, rolling, fermentation, drying. The main steps for making Dian broken black tea are withering, cutting, rolling, fermentation, drying. Generally, the unshredded Dian black presents more sweetness and richness in taste when compared with broken black tea which has strong flavor and taste. This is one of the reasons why Congou black tea is often used as senior gifts. Dian Black tea is good to enjoy with the additions such as sugar, or milk. Yunnan Gold (滇紅工夫茶 or 滇紅; pinyin: diānhóng gōngfū chá): A Dianhong tea with fewer golden buds and more dark tea leaves. It is on par with the pure gold, and is priced similarly, but makes teas with slightly different characteristics. The brew presents a brassy red color different from other black teas and a vivid sweetness not quite as intense as “Yunnan pure gold”. Classified in Orange pekoe grading from OP to TGFOP. Broken Yunnan (滇紅碎茶; pinyin:diānhóng suì chá): A cheap tea used for blending which contains very few golden buds and is generally bitter on its own. This tea is easily identified by the largely black dried leaves with only a few bursts of golden tips. The brew is dark and not brassy but reddish-brown. The taste can sometimes be as strong as cooked pu-erh tea. Classified in Orange pekoe grading as BOP. 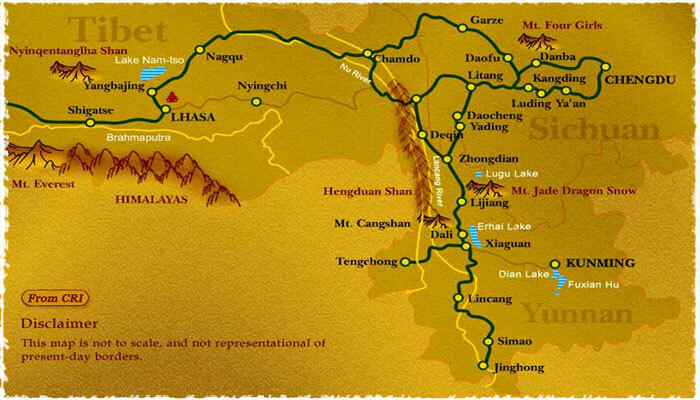 The main Dian black producing areas in Yunnan are Lincang, Baoshan, Xishuangbanna, Dehong, Honghe, including more than 20 counties. The main tea producing areas in Yunnan spread along 23°27 N where scientists believe that the climatic conditions are beneficial for biological diversity. 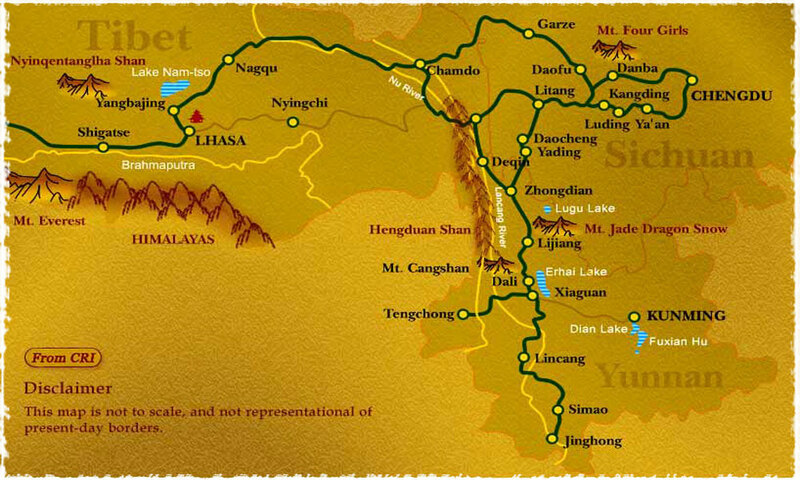 Geographically, the producing area of Dianhong black tea in Yunnan can be divided into 3 main parts: West tea-area of Yunnan, South tea-area of Yunnan and Northeast tea-area of Yunnan. The west tea-area is primarily located in 4 cities of Lincang (临沧), Baoshan(保山), Dehong(德宏), Dali; the total planting area is about 52.2% in Yunnan province with the 65% of the total production in Yunnan. The south tea-area is slightly smaller than the west tea-area; however, it is regarded as the birthplace of tea and tea culture in China. The main tea producing counties in this area are Simao(思茅), Xishuangbanna(西双版纳), Wenshan(文山) and Honghe(红河), the tea area and tea out account for 32.7% and 30.8%.